A.J. 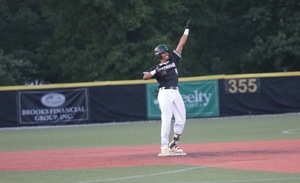 Lee celebrates after his ninth-inning double in game two of the LCS finals on July 29. As A.J. Lee (Maryland) stepped into the batter’s box with two outs in the top of the ninth, the Big Train fan section went wild. The shortstop proceeded to drive a double down the third-base line into the left-field corner. The crowd only got louder. But the win didn’t come for the Big Train in game two of the Cal Ripken LCS, with a groundout and a fly-out ending the inning and giving and Bethesda fell to the Baltimore Redbirds 3-1 on Sunday. After the loss the three-game series is tied at one game apiece. A three-RBI triple from Carl Gindl gave the Redbirds the lead early, putting them up 3-0 heading into the third inning. Big Train starter Carlos Lomeli (St. Mary’s CA) fought back the next inning for a three-up, three-down half, gaining momentum for Bethesda. He went a full six innings, giving up three runs and striking out seven, with five of those strikeouts coming with men on base. A sacrifice fly from Jacob Westerman (San Francisco) drove in Justin Wylie (Arizona) to give the Big Train their first run in the top of the fourth. That was the only run for Bethesda, as the Big Train stranded a total of 10 runners over the nine innings. In the top of the seventh the Big Train threatened the Redbirds’ lead, with Fox Semones (James Madison) on second and no outs. But after Tyler Villaroman (San Francisco) popped-out foul, Semones tagged up and went for third. The throw across the diamond was in time, and the Big Train were left with two outs and no men on base. Then, with the Redbirds threatening in the seventh with men on first and second, a clutch throw home from Villaroman in center field caught Gindl at home plate for the final out of the inning. But that momentum, and the cheering of the big Big Train fan section, didn’t translate into the batting box in the top of the eighth, with Bethesda falling in order. In the eighth the ball fell to Cam Vassar (James Madison), the second relief pitcher to be called from the Big Train bullpen. He entered after a scoreless seventh from Quinn Flanagan (Arizona). Then, with two outs and a man on first, Bethesda third baseman Carson Taylor (VA Tech) knocked down a line drive down the line, forcing the lead runner into a pickle that ended with Vassar getting the tag-out at third. Flanagan went one inning, giving up three hits and a walk. Vassar also went one fully inning, allowing only one hit. The Big Train will return home for game three, likely to be played Monday, July 30 at 7 p.m. (weather-permitting).